We have come a long way in our art skills. This year for Mr. B I have divided up his art course into two distinct parts, art appreciation and art skills. Officially these will both become part of his Art History and Studio Art credits for high school. I thought it might be helpful to share the exact steps we use in accomplishing both courses in our homeschool. I touch on it a lot in my Weekly Wrap-Ups but the nitty-gritty is sometimes helpful to see step-by-step. I will break the information up into two posts and cover each topic a little more in-depth. How about art appreciation first? For those of you who have never attempted art appreciation, you can start in high school and make it an enjoyable experience. Charlotte Mason homeschoolers may be interested to see how I have built on picture study to make this a high school level course. We cover our artists and composers chronologically and this year Mr. B is in Year Three of the history cycle (basically 1800’s and early 1900’s or Ambleside’s Year 10). The list above shows his artist choices for the year, sometimes I give him a choice. We have covered a few of the artists before so I wanted to give him some freedom to choose his favorites or move onto someone new. 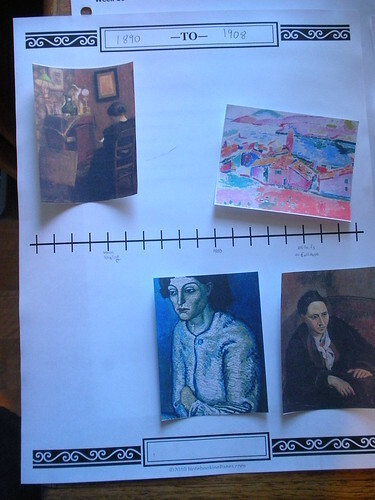 All work done in connection with art appreciation is gathered into one binder and kept from year to year. This binder becomes an on-going record of the chronological study of art from prehistoric to modern. I use a 3-ring binder that we can slip a cover into and a couple of dividers for notebook pages, coloring pages, art copywork (in sheet protectors), and end of the unit writing pieces. Simple is best. One hour per week is allotted to art appreciation. 1. Find the artist online and view their artwork. Mr. B usually takes the first hour of his study to browse the internet to find out all he can about the artist and to look at his work. 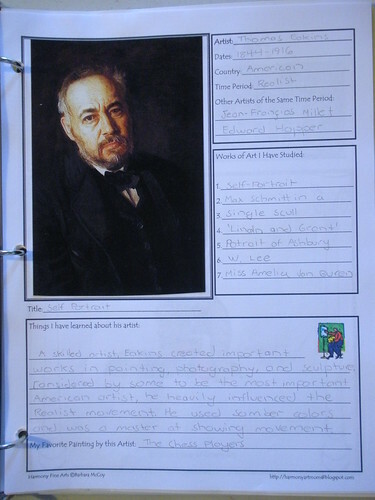 I use my Harmony Fine Arts Homeschool Art Plans -Grade 11 art plans as the basis of our study and if you have those plans you are really set to go without much work since the links are all gathered for your student. 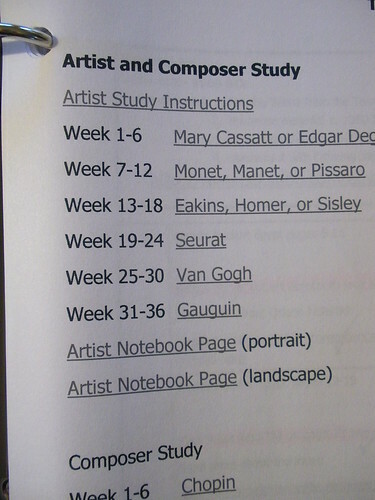 (You can also download the 12th grade homeschool art plans for free from my website.) More recently, we have started to enjoy watching slideshows on YouTube for each artist we study which makes things more interesting for my teenager. Often the slideshow will be accompanied by period music which gives your art study even more of a flavor. 2. 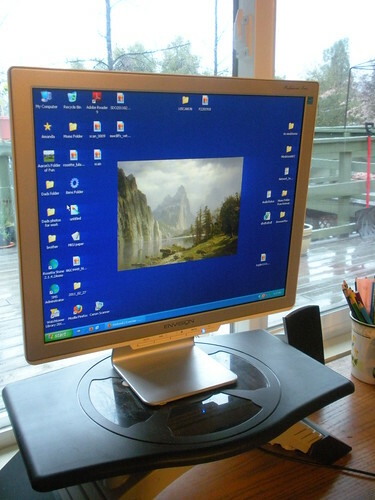 Choose a piece of artwork and make it the desktop image on the computer. This has been a staple of our art appreciation for many years and it is still a useful tool. It is simple to find the painting on the internet, right click and save to the desktop. I aim to have him change the painting once a week but sometimes we are just enjoying a painting so much that it stays put for a longer period of time. 3. 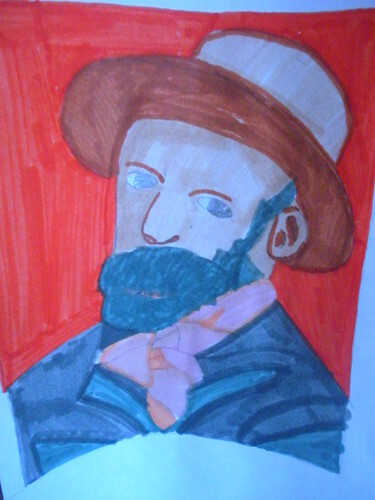 Gather facts about the artist, the art time period, the artist’s style, and the medium used in the artwork. 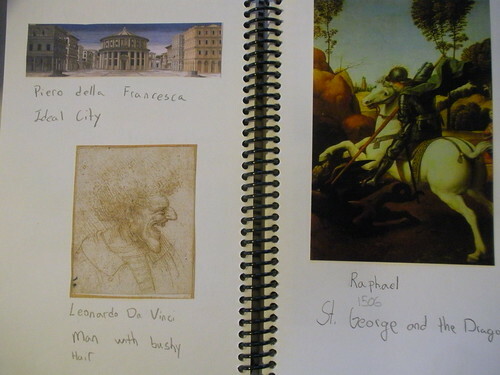 Mr. B uses notebook pages to gather information about the artist he is studying and makes lists of paintings he has viewed and especially liked. The notes are eventually worked into an outline for a one or two page report on each artist as the culminating project at the end of the six weeks. I encourage him to write his own critique of the artist’s work, to include comparisons between artists he has studied, and to give a more personal account of the artist’s life. The Annotated Mona Lisa and the Story of Painting. 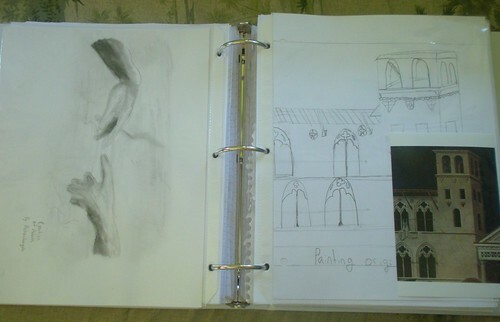 Both books are planned out in my Harmony Fine Arts plans and both books (linked here) will get you through all four years of your art appreciation/art history studies. If you have to pick one easy to read resource, I would pick The Annotated Mona Lisa. This book is a nuts and bolts book that will take you through the entire course of art history with no frills. It is the perfect jumping off spot if your teen gets interested in a certain aspect of art. I like that this book includes various topics other than just painting like sculpture, photography, video, and architecture. My boys read a few pages a week and keep notes for their end of the unit writing pieces. 5. Art copywork is simply taking a piece of art and making your own version of it. This is nothing new and has been practiced by all the great painters of the past. It is a lesson in learning to see and to learn how other artists solve problems. How do you get it to look 3-D? How do you make the shadows? How do you draw a face? These are skills that can be practiced and mastered over time by closely observing great paintings and then making your own copy. I wrote more about this idea in depth HERE. 6. Additional activities that are an optional part of art appreciation. Mr. B still enjoys using Dover Coloring Books as part of his look into an artist. 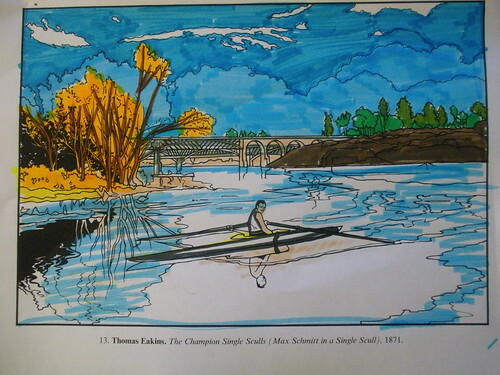 (I have written quite a bit about how we use coloring books in our art appreciation: Dover Coloring Books.) He often will work on these as he listens during his composer study. My other son uses a timeline as part of his art appreciation studies. He finds artwork to print and add for each artist. For visual-spatial learners, this is a great way to tie their art study in with other history studies. Keep a record of each artist in a notebook. We have used a spiral notebook to adhere a print from each artist we have enjoyed through the years. This becomes sort of a scrapbook memory keeper for all the different artists and art time periods we have discovered. Notebook pages will serve the same purpose and make a lasting record as well. Please note that my Harmony Fine Arts plans are organized by art time periods and not specific artists. If you use my plans you will have several artists to view for each six week time period with links provided. 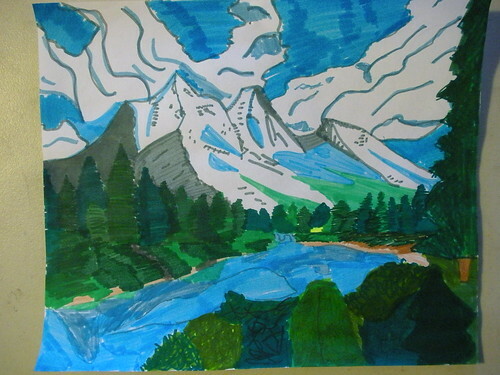 Please see the samples on Harmony Fine Arts-Homeschool . 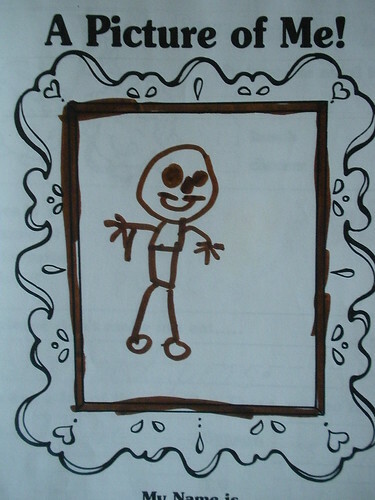 If you have younger children and want to read more about how to get started with art appreciation, I wrote a very thorough entry: Art Appreciation Starting Point. Next time I will outline how we accomplish our art skills plans in the high school years. 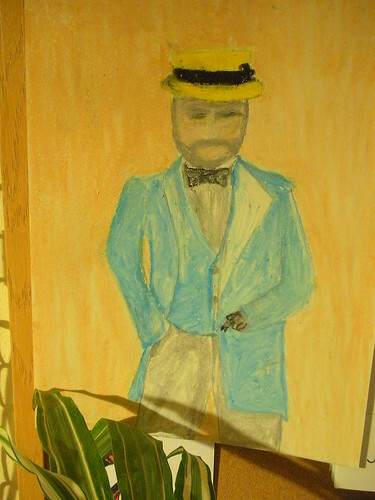 You can read that entry here: High School Art Skills. Here are a few more of our art copywork projects. What wonderful clear examples and instructions! I especially love your boys’ art copywork. Their art folders must be a source of great joy and pride! This is FABULOUS! Looking forward to reading about your studio arts studies. Part 2-Art Skills is in the works. I like seeing it all laid out like this. I’m not so good at picking up the details from the Weekly Wrap ups. I especially appreciate hearing how you count art for high school credit.